It's been a long-standing tradition in games & demos that sine waves can be approximated by parabolas (see the graph at the bottom). They're a little boxier, and deviate to an error of about 6%, but generally work for doing quick and dirty trig. Here's a simple implementation ripped from from Too(C)o(M)p(L)ex by Cruzer/Camelot, and adjusted a bit for clarity. The original source is in the download from the CSDb page, and uses self-modifying code to hold the value and delta. The accelerating value we calculate is held in a 16-bit number, the high byte of which we will use to fill in the values in the 0-255 sine table. This is required, as when the curve is on its more “flat” regions, the delta is much less than 1/256th of the amplitude (what a single byte can hold). The outer loop only spans 1/4th of the period (ie, 0-1 from the graph), as each quarter can be reflected onto the other. As the value accelerates from 0-127, it's stored mirrored around $c0 (x=3 on the graph), while the inverted value is mirrored around $40 (x=1 on the graph). It uses an incrementing .X and decrementing .Y to accomplish the mirroring. 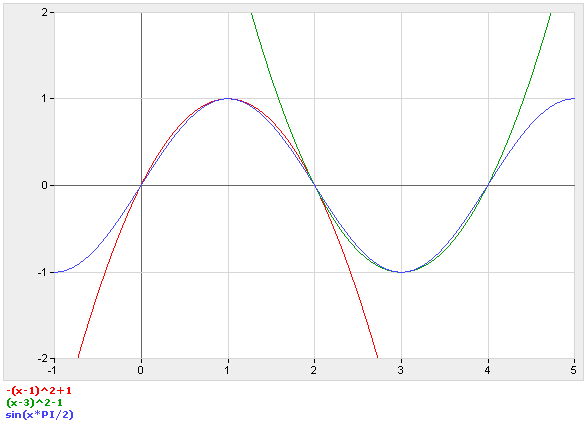 Thus, the sine values are unsigned with a DC offset of $80. Any base-2 amplitude should be likewise possible.